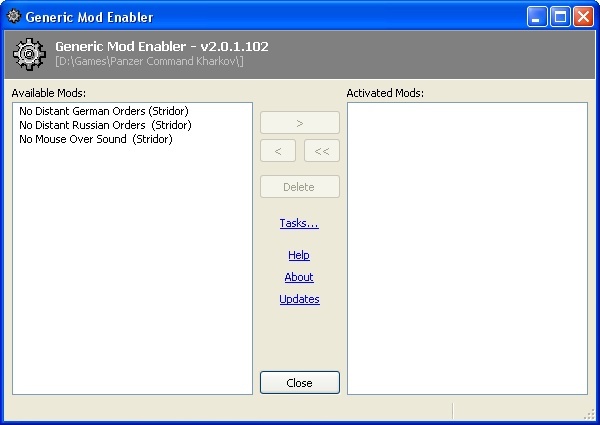 First of, what is a MOD enabler? A MOD enabler is a tool for enabling and disabling mods, i.e. 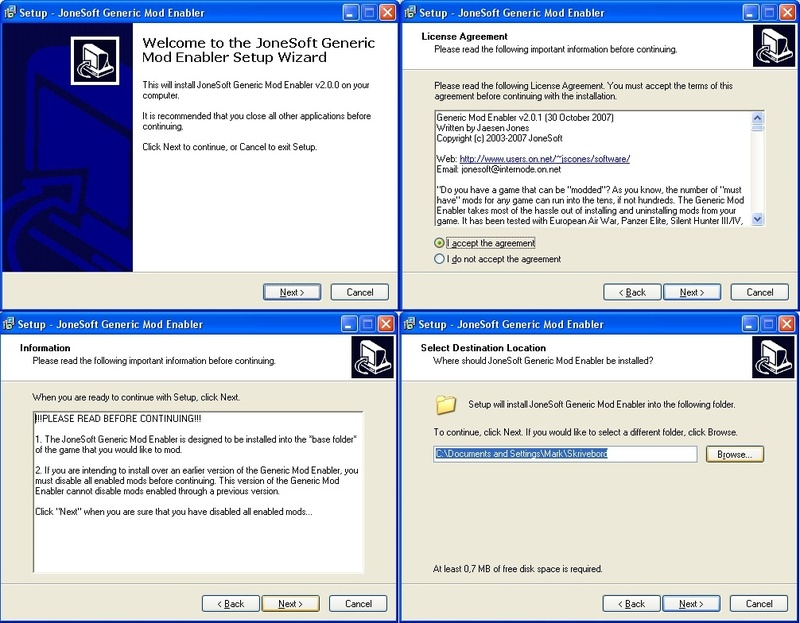 the tool handles the copying of files to the correct folders and then remove them again at the end users command. 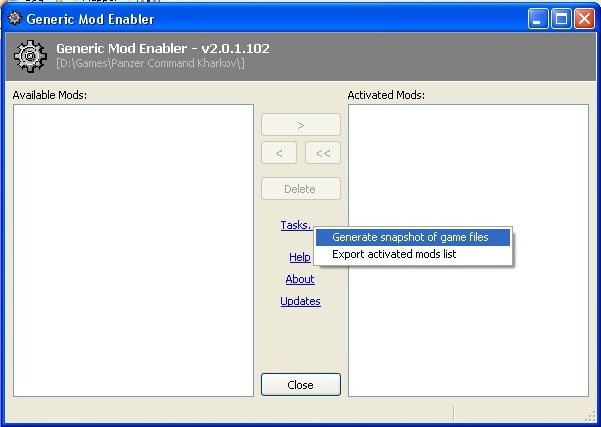 A perfect tool for this is "The Generic Mod Enabler" by JoneSoft and you can download it absolutely free of charge from the official homepage. 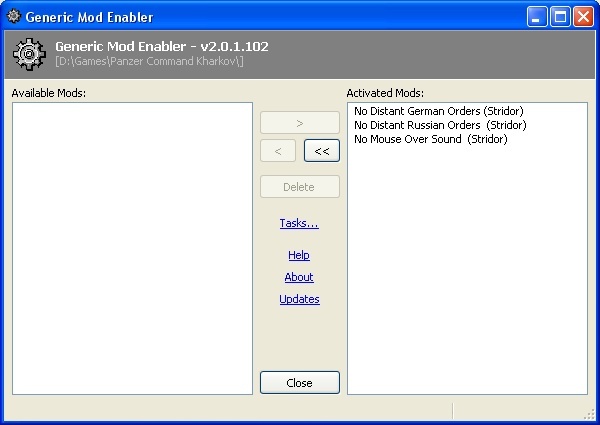 I will be using this tool for the rest of the guide and have been using it for handling MODS for games like rFactor, Silent Hunter 3 & 4, Panzer Campaigns, EEAH/EECH and Combat Mission. JGSME doesn't use some sort of compression like the LOMAN MOD manager, and therefore will an activated MOD files be in the MOD folder, in the game folder and the original files (if overwriting something) in the backup folder. This can be an issue for very big MOD's and low disk space. But again, nothing that have giving me troubles. 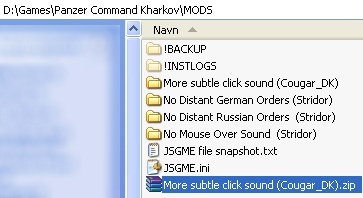 Start JSGME from the desktop icon (if you selected that option when installing) or browse to your Kharkov folder and double click on the JSGME.EXE. 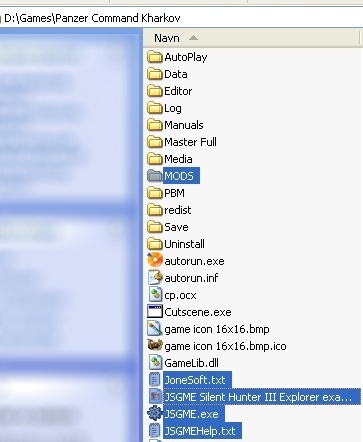 After JSGME starts, click the "Tasks->Generate snapshot of game files.". This make a .txt file with some info about your clean version of Kharkov and can help you when you want to clean up your Kharkov installation. We are now ready to use JSGME. First we need one or more MOD's that made for JSGME (way more simple than it sounds, more of that later). 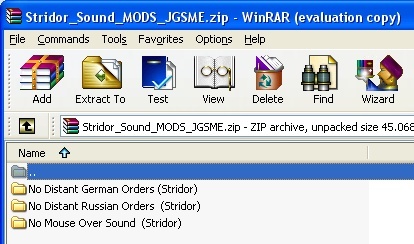 If you don't have any you can try this one: Stridor_Sound_MODS_JSGME.zip which I will use as an example. 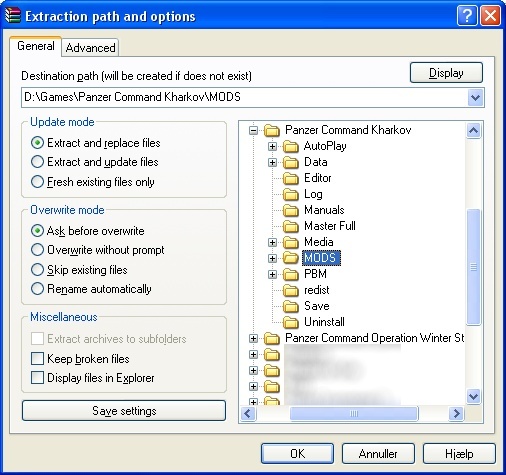 Download the MOD and open the zip/rar file with your chosen unpacker, I normally use WinRAR. You are now ready for playing Kharkov. Enjoy yourself. 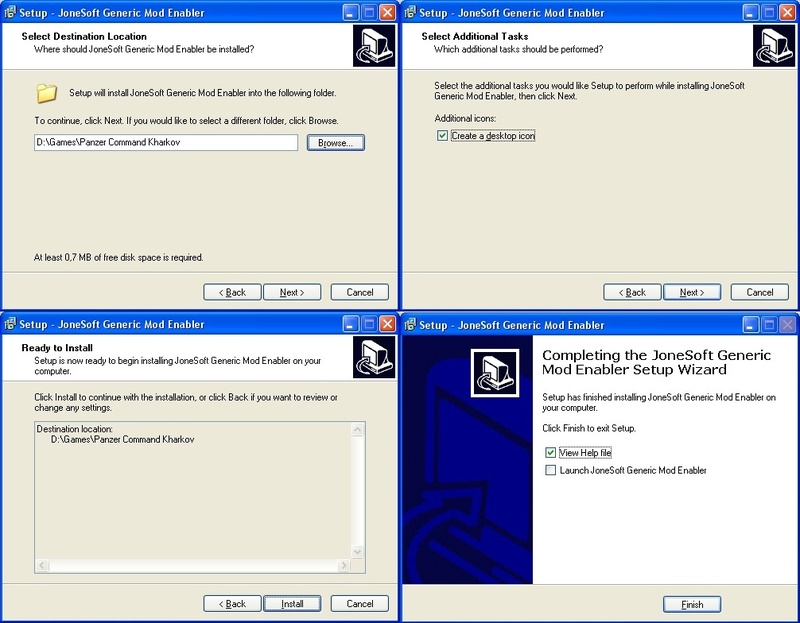 Creating a MOD is way beyond this guide, but how to make it JSGME ready will be covered next. And I want to make a MOD that changes the "click" sound played when I select something in-game. The sound played is the "MM click.wav". I change the sound file in some kind of editor and have the changed file on my desktop. Let's make it a JSGME MOD. 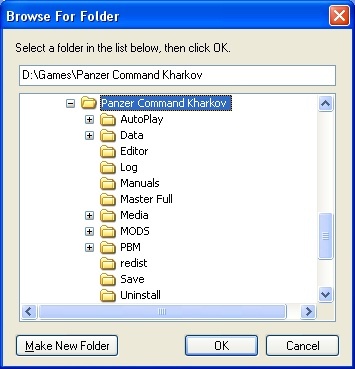 This is easiest done by going to the MODS folder in the root of Kharkov and making a new folder. The name given here will be the name users of your mod will see when using JSGME, so please give the folder a saying name. And if your MOD is one that will have many changes over time then please consider adding a version number to the folder name. I know the above is a simple example, but a MOD that changes files in different folders and adding new content is as simple to do. And the best part is that when testing your own MOD you can activate/deactivate it to make sure it works as it should before releasing it. Its pretty easy to spot a misplaced folder when done this way. 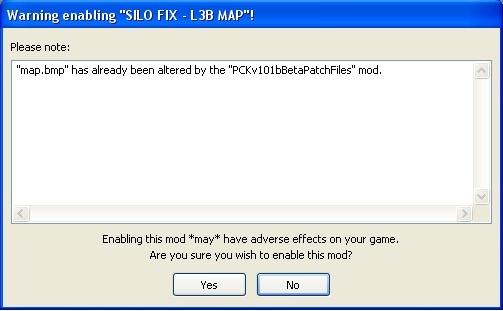 Sometimes a MOD will change file(s) already changed by another MOD. Since this normally can cause trouble this is a more advanced topic but nothing to be afraid of since JSGME can help you. Matrix released the beta 1.1b patch as a ZIP file and therefore is pretty easy to use as a MOD since you make the folder in the MODS folder and unpack it there. A normal user should stop here and contact the MOD creators and hope they somehow can merge their MOD's. If you can't wait and want to see what happens when activating the MOD you can do this, perfectly safe. So JSGME helps you track the MOD's and you can perfectly safe, play around with the MOD's. This will be covered at a later time. Status: offline Its my hope with this guide that 1) people making MOD's will release the MOD's in this format and 2) that us gamers uses more time playing than handling files. Status: offline Thanks, Cougar. Great job! Status: offline Thanks from me too. I didn't know about the folder in the folder routine. This will help me use JSGME with other games now. Status: offline After installing JSGME in my PCK folder and reading the Help file, I now see that the folder instructions are there, I just didn't get it. Thanks for a well done tutorial. Status: offline Thanks for the kind words! I think if this tutorial isn't in the Maxtrix front folder then it should be!!! Erik, you listening?? We know you are . Status: offline Big thank you Cougar...great tutorial on how to use this great mod tool. this game gets more and more fun! who needs "Theatre of War" anymore. tell it like you think it is! No !BACKUP or !INSTLOGS folders. Should I make them or what? 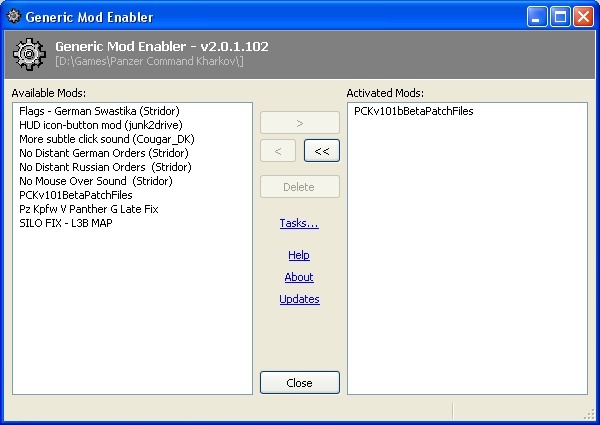 what you do is when ever you get a new mod downloaded you just put it into the MOds folder under PCK. Than it will automatically show up in the enabler and all you got to do than is to enable it in there (switch it to enabler side)- thats all. 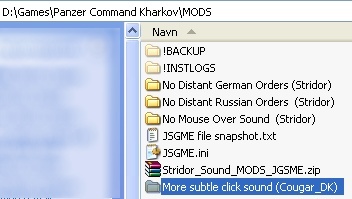 Hi MR, I'm sure you missed this step: "Start JSGME from the desktop icon (if you selected that option when installing) or browse to your Kharkov folder and double click on the JSGME.EXE. After JSGME starts, click the "Tasks->Generate snapshot of game files.". This make a .txt file with some info about your clean version of Kharkov and can help you when you want to clean up your Kharkov installation." If you do this, JSGME should make the MODS folder. It makes the MODS folder but not the !BACKUP or !INSTLOGS sub-folders that you show in your screenshots. I used your tutorial step by step till I got to that point where I don't have those sub-folders. I'll just go play with it and see what happens. Once you start activating and deactivating mods it should make those two folders ... !BACKUP and !INSTLOGS. Ok, when I was following along in your tutorial you showed them in the picture and said it was extremely important that it make all the folders and sub-folders so I thought the Enabler was skipping a step with my installation. I'll play with it some tonight if I get a chance. Hi MR, if you take a look at this picture they folder icons is dimmed, I'm pretty sure its because they are hidden and I have chosen to show hidden files and folders. I will check it out when I get home and update the guide. Thanks for the feedback! Status: offline The !BACKUP and !INSTLOGS folders is indeed marked as hidden. I have updated the guide. The !BACKUP and !INSTLOGS folders is indeed marked as hidden. I have updated the guide. You guys are doing all the work here! Status: offline Official homepage of JSGME seems to be down. 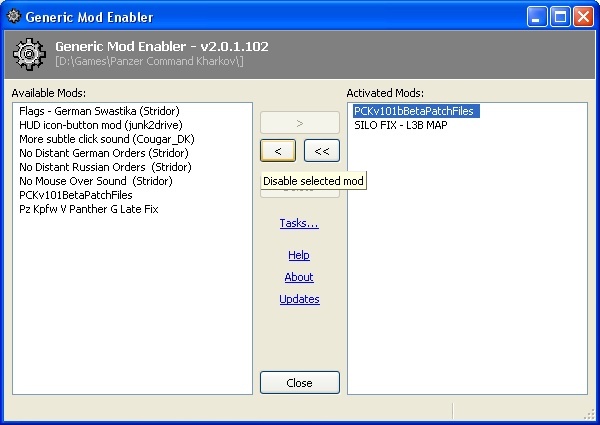 Cannot find the mod enabler (i downloaded a JSGME versione but it has no setup, just an EXE file :( ). Could someone PM me the mod enabler? Status: offline The setup exe is what you need. Put it (or a copy) in your PCK folder, then run it from there. Status: offline I have updated the link to the homepage of JSGME. Sorry for any troubles this have caused. Status: offline The homepage has been down for some time now. Status: offline Hi, when I click on the link for the official homepage to download the software it show URL request not found. Could you pass me another link so I can try to get to them? Thanks. Hi, when I click on the link for the official homepage to download the software it show URL request not found. Could you pass me another link so I can try to get to them? Thanks. the .7z is a 7-zip compression format. seven zip is a free compression utility. Status: offline Back from a 4 year hiatus. The JSGME thing is new to me- had a bit of trouble finding it to install, but got that done. Tried as best I could to follow the instructions EagleMountainDK created. Everything seems ok- JSGME installed in the G:\SteamLibrary\steamapps\common\Gary Grigsby's War in the East folder, I see it when I launch JSGME, and I can move it to the right side, as an Activated Mod, but when I launch WITE, its still the vanilla map. Any suggestions? Back from a 4 year hiatus. The JSGME thing is new to me- had a bit of trouble finding it to install, but got that done. Tried as best I could to follow the instructions EagleMountainDK created. Everything seems ok- JSGME installed in the G:\SteamLibrary\steamapps\common\Gary Grigsby's War in the East folder, I see it when I launch JSGME, and I can move it to the right side, as an Activated Mod, but when I launch WITE, its still the vanilla map. Any suggestions? Not sure that you meant to post in this forum, but you might try posting this question in the general forum or in the WiTE forum.